The group Kayak, from Het Gooi, was born in 1972 out of the High Tide Formation. The line-up that year featured: Pim Koopman (vocals, drums & guitar; ex-HTF), Ton Scherpenzeel (vocals, keyboards & bass; ex-HTF), Max Werner (vocals, mellotron & drums), Michel Marion (bass; ex-Stadium; that same year to Mayfly and replaced by Kees van Leeuwen, ex-Blues Service, Torch & Paradise) and Johan Slager (vocals, guitar; ex-HTF). An unusual publicity campaign to promote their first single, "Lyrics", introduced the High Tide Formation - come symphonic rockers Kayak - to the pop-oriented Dutch crowds. The sales of "Lyrics", however, were not all that successful, although the single was credited to Kayak. The follow-up single, "Mammoth" reached the Top 20. The first album, "See, See The Sun", produced by Gerrit Jan Leenders and Kayak, contained nine compositions, written mostly by Ton Scherpenzeel and Pim Koopman. It was clear for all concerned that Kayak were drawing their inspiration from Yes. 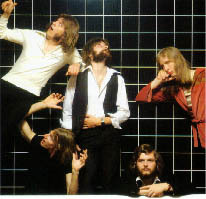 In fact, those Yes influences were also evident on their second, self-titled album. Prior to recording their third LP, "Royal Bed Bouncer", bass player Cees van Leeuwen was replaced by Bert Veldkamp. "Royal Bed Bouncer" turned out to be a more balanced effort overall, and the press greeted it with much enthusiasm; some music magazine articles speculated that Kayak would soon conquer the world. In reality, due to all kinds of ambiguous deals struck with record companies and agencies, this was not to be. In 1976, manager Frits Hirschland was at loggerheads with Kayak's record label EMI/Bovema. Hirschland implied that EMI/Bovema were not doing the best in order to promote the group. The members agreed with Hirschland, and Kayak switched to Phonogram. "The Last Encore" was released on that label, and was, effectively, their best album to date. Shortly thereafter, Pim Koopman left the band and went to work for EMI/Bovema as a producer. He was replaced by Charles Louis Schouten, who was still studying at the Conservatorium at the time. In early 1977, Kayak went on tour of England together with Jan Akkerman/Kaz Lux Band. Due to the lack of interest shown by the public, the tour was cancelled half way. In 1978, the group released their next album, the somewhat disappointing "Starlight Dancer". Important personnel changes were to take place shortly thereafter. By way of advertising in the UK music paper, Melody Maker, Kayak got in contact with Edward Reekers, who was living in Berkel-Rodenrijs at the time. He became the group's new lead vocalist. Edward replaced Max Werner behind the microphone, who, in turn, replaced Charles Louis Schouten on the drum stool. Peter Scherpenzeel, brother of Ton's, stepped in on bass. Kayak also recruited the 'Kayettes': Irene Linders (Ton's wife) and Katherine Lapthorn. With this lineup, Kayak recorded "Phantom Of The Night", which became their gold record. This album, aimed primarily at the American market, contained the huge hit, "Ruthless Queen". Subsequent US sales proved this venture to be worth the group's while. American magazine Record World announced Kayak as "the most promising act of 1979". The sound of "Phantom Of The Night" was inherited by the follow-up, "Periscope Life", a record, which received less response, but, nevertheless contained another hit single, "Anne". The follow-up, "Merlin", was a concept album about the wizard in the court of King Arthur. It revealed neo-hippie-tinged romantic fantasies of Ton Scherpenzeel's. Reekers, meanwhile, recorded an outstanding solo album, "The Last Forest". The end of Kayak came in the form of a live farewell album, "Eyewitness", released in 1981. In early 1982, the group split up. Scherpenzeel and Slager launched a new project, Europe; Ton's old friend Bert Veldkamp was invited to play bass once again. The vocalist was John Filippo (ex-Finch) and drummer - Roger Wollaert (from Belgium, ex-Lademacher's Innersleeve). The debut album, "Europe", sounded nothing like Kayak - more in the vein of Scherpenzeel's 80s solo work. This group from 't Gooi, still known as Balderdash in 1968, changed their name in 1969 into High Tide Formation and, finally, in 1971 - into Kayak. Members: Ron van der Wei (g), Chiel van Praag (p), Ton Scherpenzeel (b) and Pim Koopman (dr, in 1971 replaced by ex-Amsterdam drummer Johan Slager).